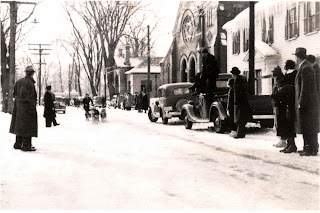 Do you ever wonder what Exeter folks did in the winter to beat off the winter blues before television and the internet? In 1938, the Exeter Lion's Club teamed up with the New England Sled Dogs Club to run a Sled Dog Race in January. Thousands of people came from far and wide to watch the dogs, women and men race. The Exeter Historical Society has many photos and color film footage of the event. Click here to watch this Exeter History Minute, which is sponsored by Exeter Mills.